In addition to the amazing LEGO models created by builders all over the world, The Brothers Brick brings you the best of LEGO news and reviews. This is our weekly Brick Report for the third week of December 2017. TBB NEWS & REVIEWS: We’ve got a few exclusive reviews and news of a handful of new LEGO sets coming your way, complete with new colors and parts. 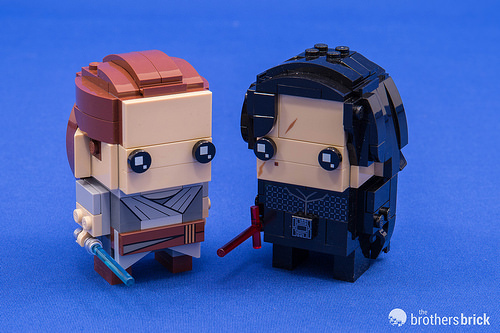 Review of LEGO Star Wars BrickHeadz 41489 Rey & Kylo Ren Limited Edition Collector’s Pack – We picked up the Target-exclusive to see if the next iteration of Star Wars-themed BrickHeadz are all they are cracked up to be. Review of The LEGO NINJAGO Movie 70656 Garmadon, Garmadon, Garmadon – Garmadon’s shark mech has 830 pieces, six minifigures, and is priced at $79.99. LEGO Star Wars 75205 Mos Eisley Cantina set revealed – The third official version of a certain “wretched hive of scum and villainy” is headed your way, music not included. Elves 2018 sets are revealed with new colours and new parts aplenty – New colors! New flowers! New leaves! New plant stems! New pieces galore! 2018 seasonal LEGO BrickHeadz revealed: 6 new original characters starting with 40270 Valentine’s Bee – The holidays are about to become a bit more blocky with these themed seasonal BrickHeadz, including a bee, bunny, witch, turkey, Santa and Mrs. Claus. TBB 2017 IN REVIEW POSTS & INSTRUCTIONS: What is the top LEGO Star Wars set of the year? We have your definitive answer, as well as a bunch of instructions to make your holiday bright. 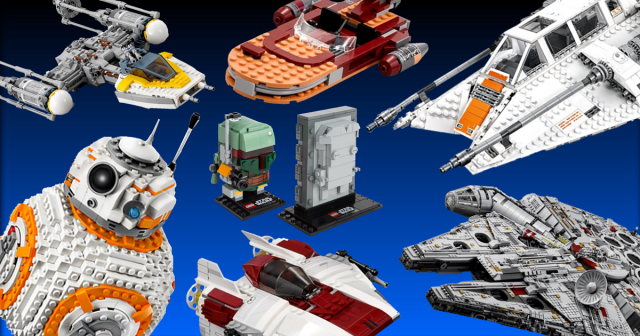 Top 10 LEGO Star Wars sets released in 2017 – Which LEGO Star Wars set takes the cake as the best of the year? It may be different than what you think! 16 of the best custom LEGO Star Wars creations featured on The Brothers Brick in 2017 –We’ve been inspired by the Star Wars universe for years, but 2017 was a stellar year for custom creations. Take a look at the best of the best from a galaxy far, far away. Instructions to build your own LEGO porg from The Last Jedi – Hopefully this version will be just as tasty as the cute creatures from The Last Jedi. Instructions to build a serene outlaw spaceship, courtesy of The Brothers Brick – As a holiday gift, we commissioned LEGO artist Tyler Clites to design a model “Outlaw Spaceship” that should make any sci-fi fan’s heart twinkle like a firefly in the depths of space. Instructions to build the iconic Jeep from Jurassic Park – This Jeep Wrangler from hachiroku24 is much more intricate than most sets we’ve seen. Rocket-powered LEGO Star Wars Star Destroyer makes a satisfying smash, Nerdist – Reaching up to 67 miles per hour, this hefty and painstakingly built LEGO Executor uses a rocket and skateboard wheels to ride a rail directly to its doom. The LEGO Star Wars Games Get it Right Where EA’s Battlefront 2 Doesn’t, Gamer Revolution – Somehow, LEGO Star Wars has managed to offer more content and fun than anything EA has to offer. What has LEGO gotten right? Two princes announce baby with a LEGO fairytale, Washington Blade – What do two princes, a mermaid, magic beans, a dragon and a wizard all have in common? This LEGO music box can play anything from Star Wars to Frozen, YouTube – Builder Dawid Marasek uses LEGO and a few metal xylophone pieces to make wonderful music.